Bali tiger, an animal that inhabits forests in Bali. Once upon a time, Bali has a distinctive animals found in the forest in Bali. The animal is the tiger. But now these kinds of extinct. Extinction caused by habitat for life is increasingly disappearing, due to deforestation in Bali uncontrolled. So the tiger to be eliminated. And the number of prey decreases, so the tiger mencadi difficult to survive due to starvation. Now, the people of Bali, where the tiger can only remember Bali. 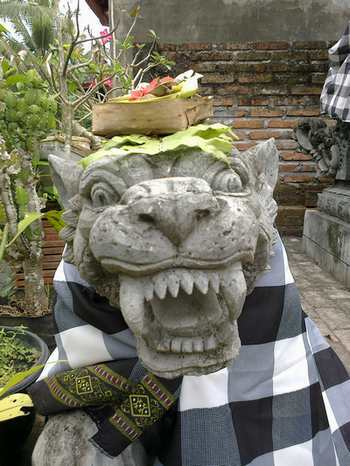 Remembering the existence of tigers that once lived in Bali, by making the tiger statue. Tiger statue also has significance as a guard. Hopefully something similar will not happen again in Bali. As with the Bali Tiger, JalakBali also suffered extinction due to poaching.